We heard about this picture long before we finally found it (years later, at the Truman Presidential Library). After our weeks working in the American Tuna Association archives at Scripps, we had a thick file of paper about Nick Bez. 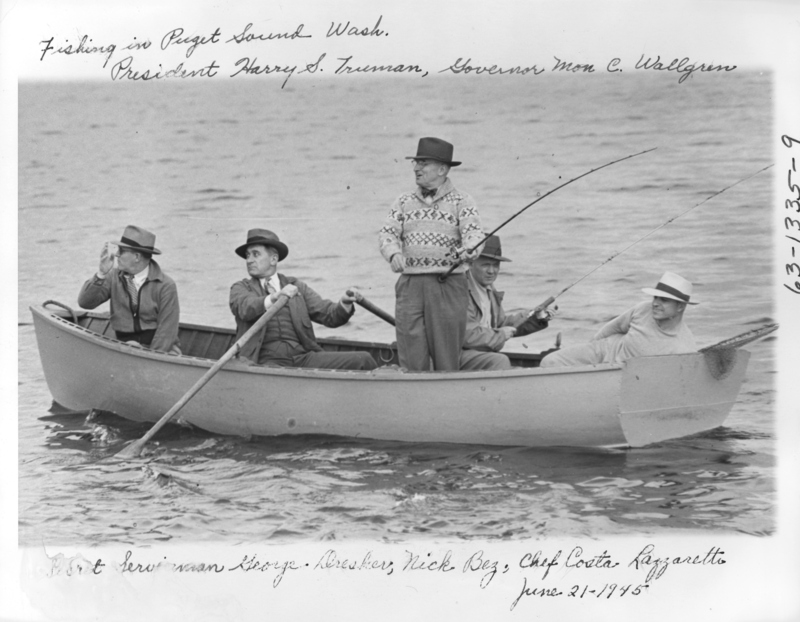 And there were several mentions that Bez had rowed the boat when President Harry Truman had come to Seattle in 1945. The trip had been arranged by Truman’s friend, Monrad C. Wallgren, a former Congressman who was now governor of Washington. Wallgren and Bez were political allies; Bez was active all his life in Democratic politics. He knew Wallgren and he also knew the state’s junior senator, Warren G. Magnuson. 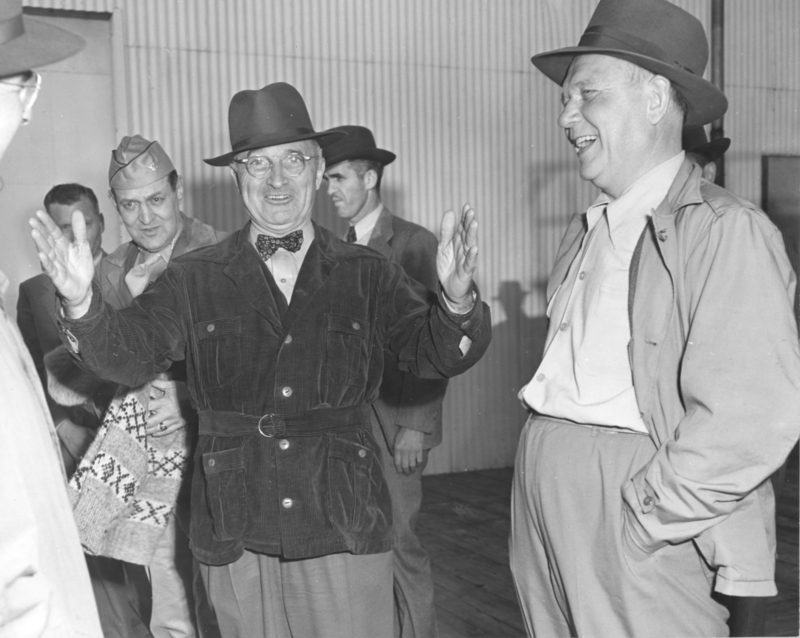 Two days after the Truman visit, Magnuson announced that the Defense Plant Corporation would make a $2 million loan to the newly formed Pacific Exploration Company, headed by Bez, to engage in exploratory deep-sea fishing on the continental shelf off the coast of Alaska. 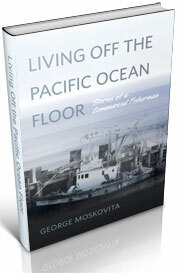 The exploration would be done using a 423-foot World War I freighter, turned into the world’s largest fishing boat, the Pacific Explorer. Three months later, on Sept. 28, 1945, Truman signed two proclamations. 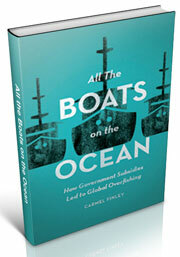 The first claimed offshore oil resources for the federal government. The second declared that the U.S. has the right to establish conservation zones off its coast and to prohibit fishing boats from other nations. Mexico immediately filed to expand its fisheries jurisdiction, followed by similar declarations from Argentina, Chile, Peru, and Costa Rica, in order to protect their own valuable fisheries from U.S. boats. This was extremely inconvenient for the State Department, trust us on this. Scholars are uncertain of just how the Proclamation came to be proclaimed (so to speak). The policy had its roots in the Roosevelt administration. 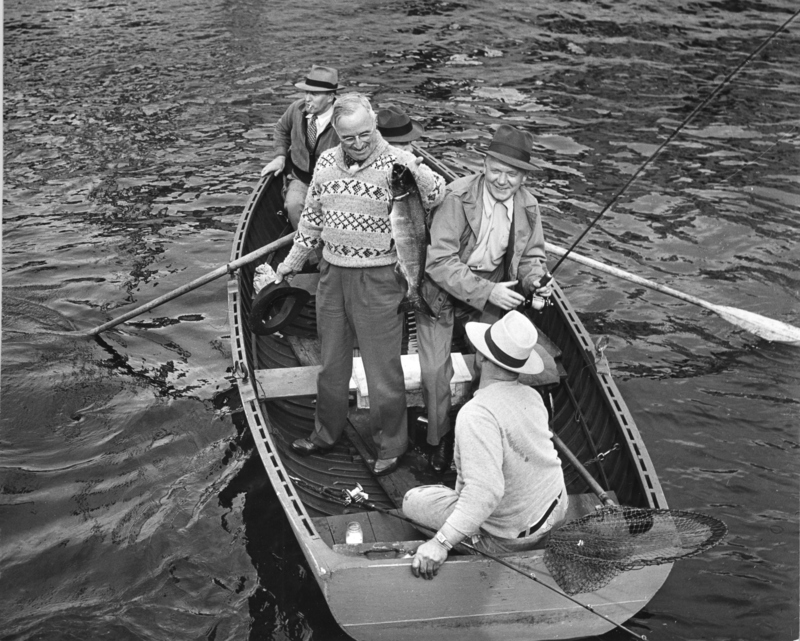 But we wonder if that conversation in the row boat came to into Truman’s mind as the piece of paper was actually put in front of him? 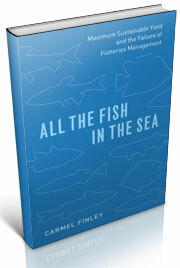 Nick was certain to have told him how confident he was about the bright outlook for American fishermen. The Japanese had fished off Alaska during the 1930s, catching king crab that they canned and sold to American consumers. It was time for the Americans to develop their own fishery, not only in Alaska, but in other areas where the Japanese had fished–the Mandated Islands in the Western Pacific. The Marshall, Marina, and Caroline islands were now under the protection of the United States. The Pacific Explorer would do it all–pioneer the catching of king crab in Alaska, explore for bottomfish, do research when it wasn’t actively fishing. In the Mandated Island, it would do the same thing for tuna–establishing a beach head in hopes other American fishing boats would follow. For Harry Truman, from a small town in Missouri and president for just a few months, it must all have sounded exciting and worth doing. Big Nick, with his heavy Yugoslavian accent, would have been an enormously convincing. The man who arrived in the United States as a penniless teenager was now one of the richest men in the Northwest, owning fishing boats, processing plants, airplanes, and gold mines. And he had the sway with both Wallgren and Magnuson to have private time with the Truman during this visit. Many Americans had big dreams after 1945. But few dreamed as big as Nick Bez. This entry was posted in Albacore tuna, American Tuna Association, Carmel Finley, Environmental History, Exploratory Fishing Base, Fishing, History of Science, History of Technology, Marine Policy, Maritime History, Nick Bez, Ocean fishing, Pacific Explorer, Pacific Fishing History Project, World History and tagged Fisheries Science, groundfish, Harry Truman, Nick Bez, Pacific Fishery History Project, president harry truman, science, trawling, truman presidential library. Bookmark the permalink.